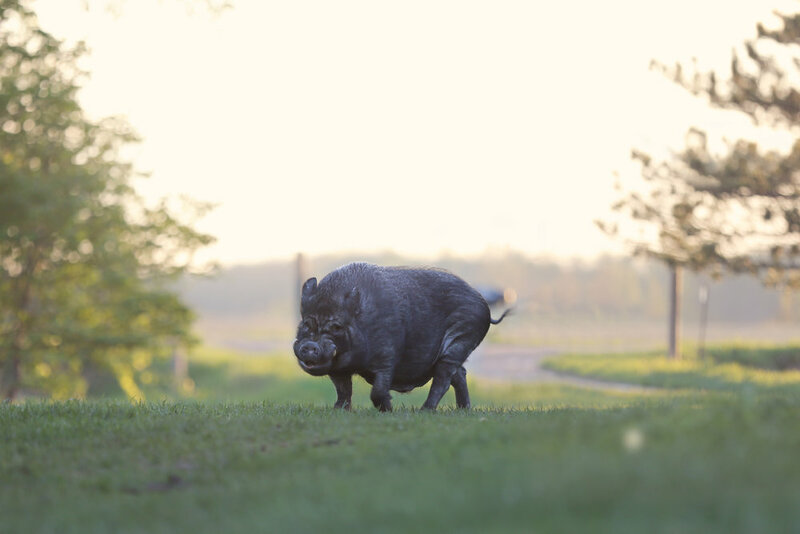 In 2012 a young woman called us and asked if we could take a potbellied pig that she had rescued. She was at a farm responding to an urgent situation where a mini horse needed a home. The people were moving and whichever animals they couldn't rehome, they were sending to auction. She got the mini horse loaded, then on her way out of the barn saw a very large pig all alone in a dark stall. She asked about him and they said, "Oh, no one will want him, he's going to auction this week." She wasn't going to allow that to happen and saved his life too. They unceremoniously rolled the poor guy up a ramp into the back of her truck. Upon getting him home she found she could not keep him contained with her horses, he kept escaping the electric fence and going for walkabouts in the small town where she lived. He was so fat the electric fence had zero effect. She ended up having to lock him in a shed and knew she needed to find a better situation for him. We went and picked him up and he was the fattest pig I'd ever seen in my life. The woman was told he was fed only kitchen scraps. We got Bruno into a dog crate, the largest one they make, and he filled every inch of it. It took 4 people to carry him to our truck. Our dear neighbor fostered him for a while because we needed to set up a house and paddock for him. He was fat blind and extremely angry and would lash out and bite. Once we got him home it took about a year to get him to a proper weight, and as soon as he lost the fat around his face and could see again he didn't bite anymore out of fear. He loved having his own private house and paddock. We have no idea how old he is, but judging from the size of his tusks, he's not a young pig and may be in his teens. He still doesn't play well with other pigs, but he is content.